Staph aureus (full name Staphylococcus aureus) is a group of bacteria that can cause a number of diseases as a result of infection of various body tissues. 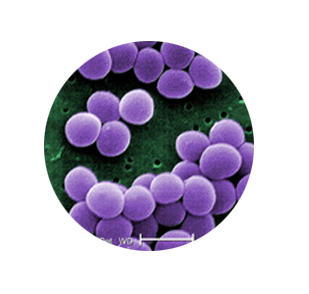 Staphylococcus is more commonly known as Staph (pronounced "staff"). Infections can be caused by a particular type of Staphylococci called Staphylococcus aureus. Illnesses and infections that are Staph-related can be mild to severe and possibly fatal. Up to 25% - 30% of healthy adults carry Staph aureus in the nose and on the skin. Most times, the bacteria do not cause disease. However, open lesions or wounds on the skin or other damage to the skin may allow the bacteria a place to grow and infections to develop. Staph aureus causes infections in and out of the hospital. It can cause boils, pneumonia, impetigo and is the leading cause of surgical site infections (SSI) in the United States. Statistics are that 1 to 3 people out of every 100 people who have surgery develop Staph-related infections. More info available at CDC site. Certain groups of people may be at greater risk. For example, those who have a compromised immune system, newborn infants, breastfeeding women, and people with chronic diseases. Families and individuals that use day care centers, gyms, schools, locker rooms, workout centers, and playgrounds should be aware of the facts of Staph aureus. These locations may have a greater risk of transmission from skin to skin contact or skin to equipment contact. Staph infections are contagious. The pathogens may be transmitted via direct contact with the infected area, bandages or via personal care items like a razor. Wounds that appear red, swollen, have drainage or be accompanied by a fever, may be infected. For everyone, wounds, cuts, and scrapes should be kept clean and covered. Staph aureus may be transmitted from one part of the body to another, from the nose to the hand to an open wound for example. Maintaining good hand hygiene and nasal hygiene is important, whether at home or at the hospital. Parents should take care of cuts immediately and emphasize to children the importance of hand hygiene. Bumps or blisters should be watched for signs of infection and addressed immediately to prevent the spread of infection. Nozin Nasal Sanitizer reduces Staph aureus nasal carriage without antibiotics. Many health professionals recommend using Nozin Nasal Sanitizer to help reduce the risk of infection. We encourage you to explore the entire site. Read the Frequently Asked Questions page. Check out the Nozin Blog articles. Please feel free to submit the form below or contact us with any questions you may have.